It’s generally known that oily skin is more prone to acne. Few people know that it’s not only oily skin that breaks out, but dry skin can also cause acne. People who have dry skin with acne are not rare; you would be surprised at just how many of them are out there. Treating dry skin acne is totally a different situation. Acne breakout usually occurs when the pores are blocked with debris. This is generally due to overactive oil glands, but it can also happen because of dirt and dead skin from overly dry skin. As you search around for the products for treating acne, you will realize a most of them are meant for people having oily skin and using them will only make your skin even more dry and irritated. So, dry skin acne treatment needs a different approach. Read on here to find out remedies about how to deal with dry skin and acne. In case of dry skin, practically the skin barriers are damaged that let moisture to escape which otherwise is critically needed for the health of your skin. So, conserving the skin’s natural moisture is obviously first step to help maintain the skin glowing and acne free. 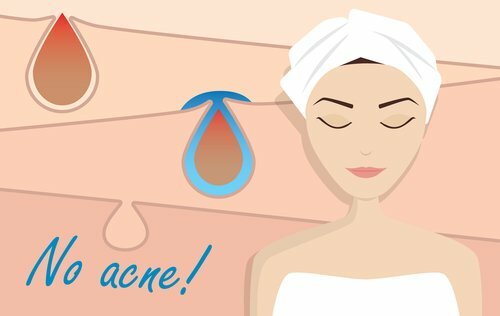 What To Do About Dry Acne Prone Skin? 1. First Step: The apparent first step is to get rid of the irritant or factor that causes dry skin. Many times that’s possible by just stop using soap or switch to a gentler cleanser. But at times it does not work, such as the dry climate in winter. 2. Moisturizer For Acne Prone Skin: The second obvious step is to moisturize your skin daily to keep it from drying. How do you prevent an acne breakout and still moisturize? Simple! Choose a suitable formulation that is meant for sensitive skin, because they are light and still effective. Don’t be tempted to use moisturizers that are meant for acne-prone skin, in fact that would be a big mistake as they are usually extremely drying. Moisturizers are generally a mixture of water and fats. Whereas heavier formulations have more fat and are often called creams. On the other hand lighter ones contain less fat, but more water and are generally called lotions. Stay away from using creams as they can lead to more problems in acne-prone skin and moisturizers that contain preservatives, fragrances and colors. For your face choose something that’s specially formulated for facial skin. Mostly they are all noncomedogenic, so won’t make your face look too greasy. 3. Best Way To Moisturize: Besides using a good moisturizer, how you use the moisturizer is also important. Their function is to pull moisture from the water that’s in the skin. They can’t pull in moisture from the environment. To get the best results you need to moisturize right after bath or washing, while your skin is still damp. As the bath or washing makes water to penetrate into the skin, so you simply have to lock it in with a moisturizer. To achieve this, simply pat your skin gently with a clean, soft towel to take away excess water. As your skin is still a little wet, apply the moisturizer and wait for your skin to dry. 4. Choose Your Cleanser Wisely: The cleanser you are using may be responsible for your over-dry skin. We recommend non-foaming cleansers because they are less drying than the cleansers than the foam ones. Make sure to use a non-medicated cleanser in case you are already applying a topical medicated ointment, cream or lotion for acne. However, if you are considering using a medicated one then you should consult a dermatologist or skin specialist first! 5. Do Not Over Wash: Over washing strips away lot of the natural oils and moisture from the skin. Wash your face just once a day, that too with gentle, foamless cleanser. Before going to sleep at night, remove your make-up and a few splashes of cool water is all that you would need to get rid of the dirt from your skin. This way, you not only can keep your skin clean, but also will not make it any drier than it already is. 6. Protect Your Skin From Harsh Environment: While going out on a windy, cold day make sure to protect your skin from the wind. Wear hats or scarfs on such cold days, otherwise your skin will get robbed of the moisture it already has. Similarly sunny days can also strip off moisture from your skin, if you don’t take precautions. Use nonacnegenic or noncomedogenic sunscreen to protect your skin. 7. Choose Lotions And Creams With Care To Treat Acne: As majority of the acne treatments are drying, you need to select those ointments, lotions and creams that are less drying than others. Try to feel your skin after using them. Always make sure that what ever you use, do not use more than what the instructions on the product label says. (i) Honey: Honey contains natural antibacterial properties and works to clean out the pores and get rid of dry skin, thus can treat dry skin acne and heal blemishes. Honey can be used as a spot treatment. Apply directly onto your blemishes for about 15 minutes and then rinse it off with cool water. It can also be mixed in with other ingredients and used as a facemask. For best results use raw honey or if that’s not available, use organic honey. (ii) Yogurt Mask: Yogurt has lactic acid that works as a gentle exfoliant on dry skin. Use full-fat yogurt as it contains live cultures also, so it will not only nourish your skin but also remove dead scales. Apply a thick layer and let it dry for about 15 minutes, and then rinse it off with cool water. To make it more effective just add in some pulverized oatmeal (churn it in a blender or a food processor) and lightly massage your face while applying the mask.